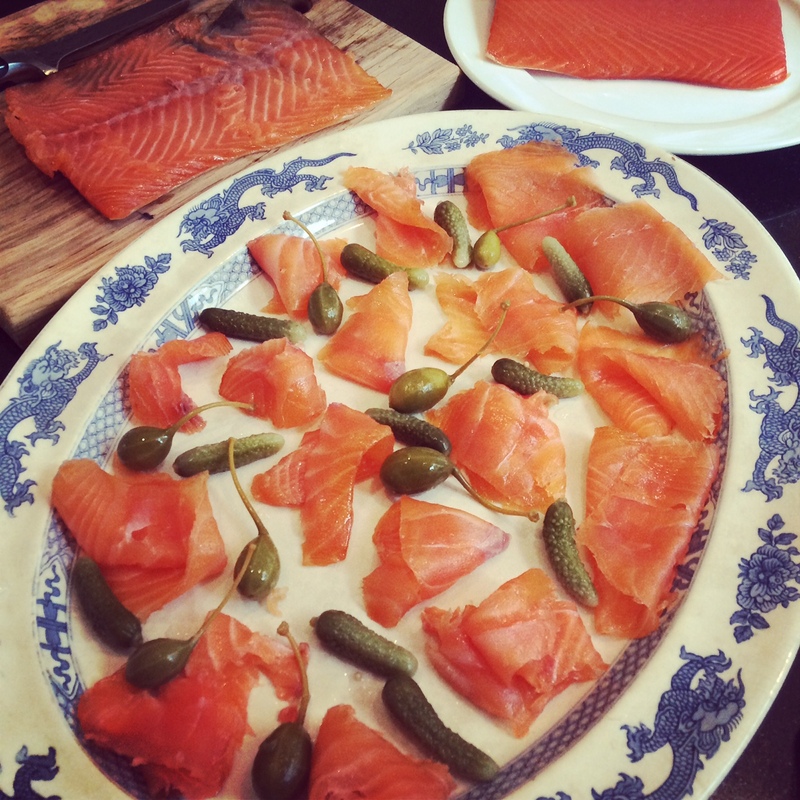 Mark Hix smokes all the salmon for his restaurants, smoking it in his North London back garden. If its good enough for Hix its good enough for me. As mentioned in some of my other posts, curing fish and meat preserves the flesh by inhibiting the growth of bacteria. Smoking also protects by creating a layer of wood oils that prevents oxygen from penetrating the flesh which also slows spoilage. A combination of the two, greatly increases how long the fish is edible for. Salmon can be hot smoked or cold smoked, hot smoking also cooks the fish. 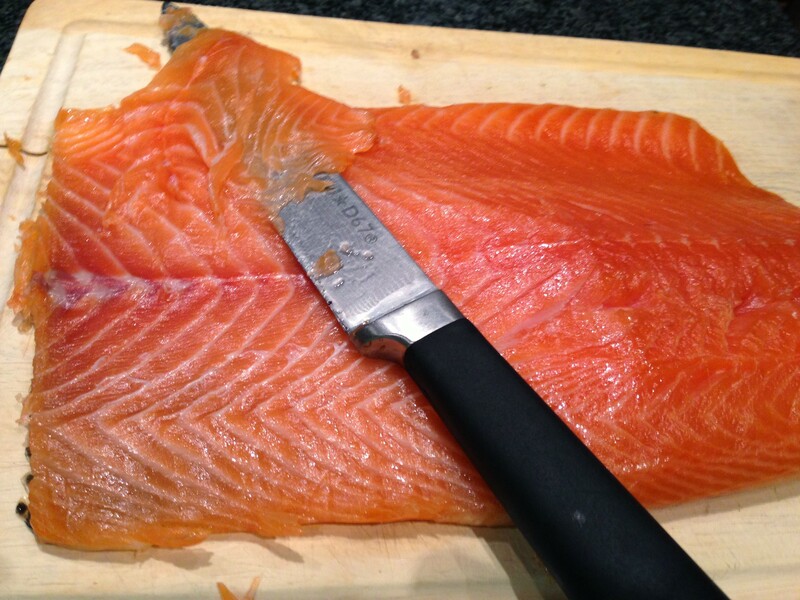 In the UK, we are more used to cold smoked salmon which remains raw. That’s the method I am using here. First, the fish is dry-cured in a mixture of sugar and sea salt for 5 hours. Wash the fillet in water and dry. 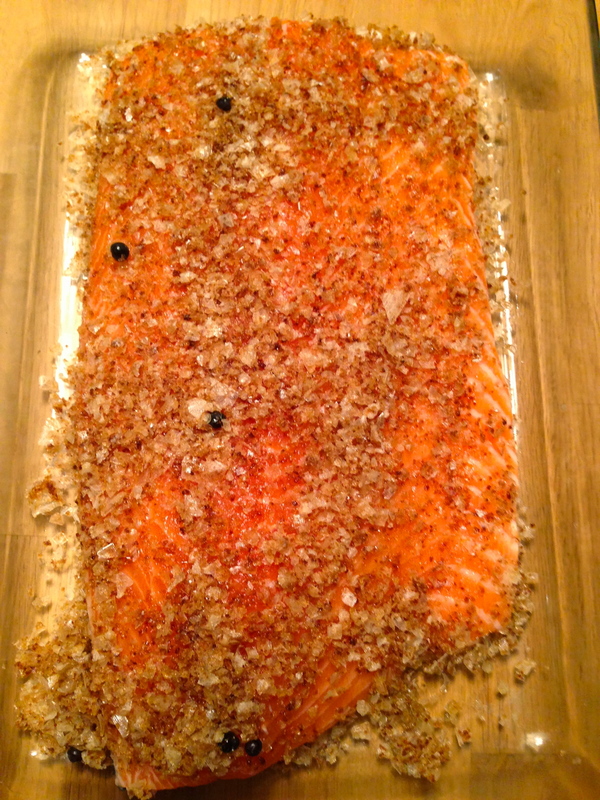 Sprinkle some of the cure in a non-metallic dish and lay the salmon skin side down. Sprinkle a fine layer of cure so that it just covers the flesh. Apply less to the thin tail end than the thick fillet (head) end so as not to over salt the thinner end. The more salt you add and the longer the cure is left on for, the longer the finished salmon will keep for but the saltier it will taste, it is a balancing act and you will have to play around for your perfect smoked salmon. Within the cure you can also add any other flavourings that you like, dill is a classic paring with fish for example. I cure my salmon for 10 hours before moving onto the next stage. After curing, wash the filets in cold water to remove any remaining traces of salt and, in a clean change of water allow to soak for half an hour. This allows the excess salt near the surface to escape. Do not leave to soak for more than an hour or the curing process will be reversed as water will be drawn back into the fish and salt drawn out. Pat dry and leave the fillet to air dry for 12 -24 hours before smoking. This drying period allows the salt to equalise throughout the salmon rather than being mainly on the surface. The weight of the filet will drop due to the loss of water, leaving the flesh firm and springy. Now time for smoking, I would suggest cold smoking the salmon for between 8 and 10 hours but you can smoke it for as long as you like. You can make a cold smoker very economically at home. My first smoker was made out of a garden incinerator bin and a cold smoke generator, a genius little device that is made of a metal gauze and filled with sawdust. Once you have smoked the salmon for 10 hours, remove from the smoker. You can leave it to air dry for another few days and to mature but it is perfectly good to eat at this stage and will keep for about a week or so depending on how much salt you have added. When smoking and curing food at home you have to rely more on instinct and less on a label that says ‘best before.’ Chances are if it smells and looks off it is. Trust your instincts. Anyway my first attempt at smoked Salmon was very, very successful. One of my friends, Jamie, who is not a smoked salmon fan absolutely loved it and kept going back for more, result I’d say. It is a lot firmer and meaty than the vacuum packed stuff you buy at a supermarket and on a par with good salmon I have had in restaurants. Christmas sorted!